But not a turkey! Happily, my lovely neighbor, Roz, brought me leftovers from her son and daughter-in-law’s feast. Totally delicious, gluten-free, and way easier than making a Thanksgiving meal for myself. So, the layers are almost entirely basted. My knees need a break, so I’ll do a few more rows in the morning. Here’s the incredible news: the printed fabric that I bought for the backing actually made a panel big enough for the whole thing. We were pretty sure the length left on the bolt at CQ wouldn’t suffice, and I’d have to piece in some other fabric to compensate. Was kind of dreading having to figure that one out, but lo, I ended up with exactly 1.5 inches extra fabric on all four sides! Holy cow, someone up there really likes me this weekend. The batting is Thermore, in case you were wondering. 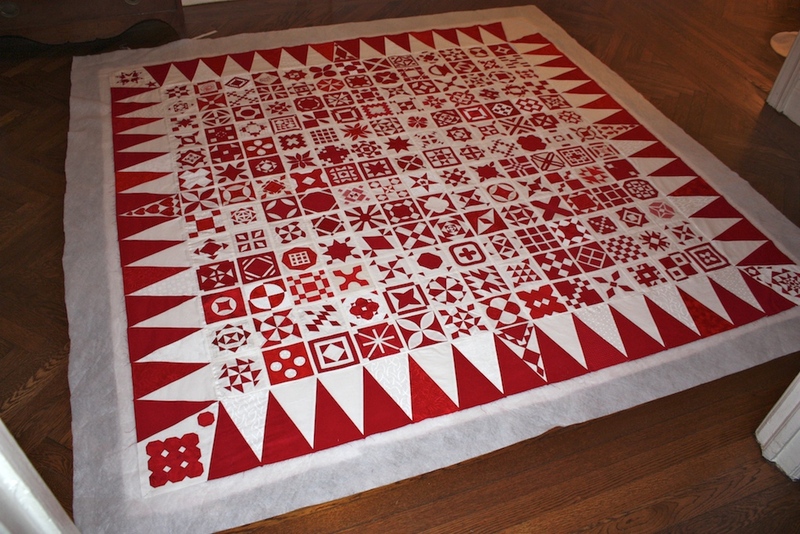 I’ve used it for the past few quilts, so I went with the familiar and predictable. Predictable is important when operating on such a tight schedule.